The West End Plaza, located in the quaint, rural Pocono Mountain community of Brodheadsville, PA. became the first in the Amato Properties’ family of shopping centers in 2002. The flourishing open-air center is comprised of over 80,000 sf of retail, restaurant and office space, including two free standing buildings. 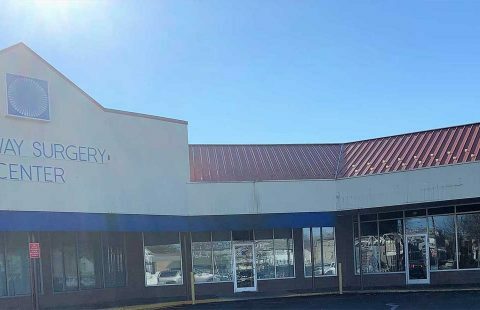 In addition to being anchored by Peebles, Dollar Tree, Sunoco and Anytime Fitness the West End Plaza is home to Holiday Hair, Hometown Brand Center, Levels Dance Studio, Trendi Pawz and the irresistible flavors of Mike’s Pizza, The Bagel Experience and Polish Delight. The West End Plaza, Chestnuthill Township, is in the Pocono region of Monroe County, PA. The Plaza is strategically located at a signalized intersection on Route 209 and Weir Lake Road. Traffic counts exceed 19,000 vehicles per day. The property benefits from its well-established location and its close proximity to Interstate 476 (Northeast Extension) and Interstate 80. This retail corridor is a convenient and popular shopping destination for the local population and Pocono Mountain tourists. West End Plaza is centrally located (90 miles) to both New York and Philadelphia. Amato Properties aims to exceed our client’s expectations. Our team of professionals will share their extensive knowledge of business development and the marketplace with you long after the ribbon cutting. They will shoulder the issues of planning, development and property management. Joe Amato Properties is the premier commercial leasing company in Northeastern Pennsylvania. Join our growing family today! Which propertie(s) are you interested in? Site Designed by Positive Results Marketing Inc.